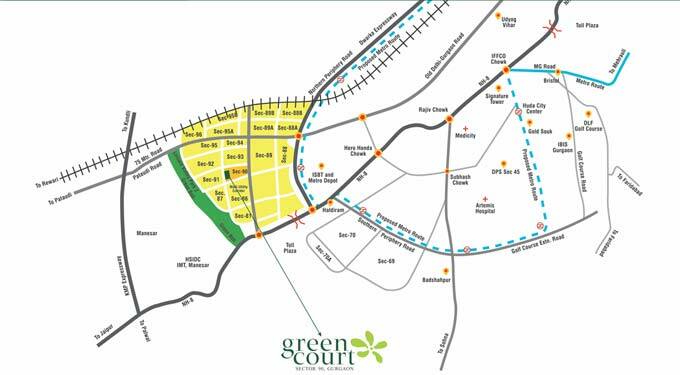 Looking for a green space, where you can come back to in the evening and feel happy and blessed Well, here you are, Gurgaon today basks in the glory of being developed in the most organized manner amongst all cities in the NCR region. Located in sector 90, Gurgaon, Green Court, is an affordable residence with abundant green space for its residents to breathe green and live green. With a location, as prime as this, and good road connectivity to Dwarka Expressway, Manesar and IGI airport, residents would be a lot happy. The locality enjoys rapid infrastructure development in the vicinity and benefits from being in close proximity of many upcoming commercial projects and educational institutes.